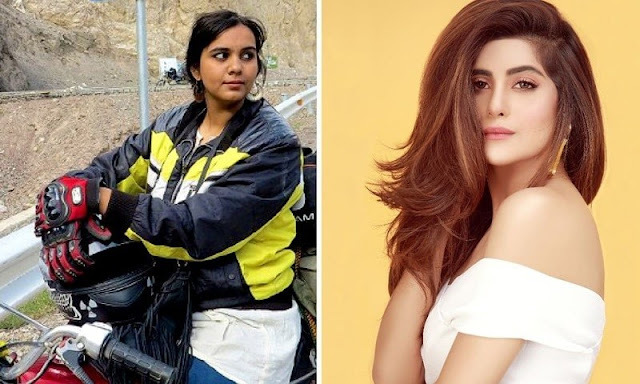 Shooting begins for Sohai Ali Abro's " The Motorcycle Girl"
Remember how vibrant Sohai Ali Abro looked in Jawani Phir Nahi Ani? But the gorgeous diva has been missing since from the big screen and doing dramas for television. These days she looks absolutely beautiful in Hum TV's Aadhi Gawahi but we really do want to see her on the big screen. And now, it seems like our wish will be granted soon. We recently brought the news about Sohai starring as the motorcycle girl Zenith Irfan in her biopic by Adnan Sarwar. The shooting of the film has now begun, as officially confirmed by Sarwar himself on his social media and to HIP, when we contacted him to ask where are they shooting at the moment and where they plan to go next? "We are in Lahore at the moment and will go up to Hunza for two weeks and by the 20th of October or so will be back in Lahore " said Sarwar. The Motorcycle Girl will be the real life story of the boundary breaking Zenith Irfan who set off on her motorcycle at the age of 20 to conquer the highlands of northern Pakistan. And with Sohai in the lead, it'll be exciting to see how the lady shuns off all the glamour and play a real life hero on her solo journey on a motorbike. In an earlier statement, about essaying the character of Zenith, Abro had shared her excitement and honor to be playing the part. "It is an absolute honor to play Zenith in his film. The role of this incredible, empowering female is one thing I can relate to and is close to my heart. I have always believed in the power of liberating women, especially considering the taboos we face in our society. I am really happy that a lot of young girls will be able to look up to me for doing something positive and inspiring," Sohai had said. Besides directing the movie Adnan Sarwar has also written The Motorcycle Girl. And Sohai to fit in to her role, had to learn to ride a motorcycle, to undertake the same journey Zenith began from Lahore to the majestic Khunjarab Pass. With the shooting having begun we look forward to bringing you guys many more updates as far as The Motorcycle Girl is concerned so do stay hooked to HIP until then.